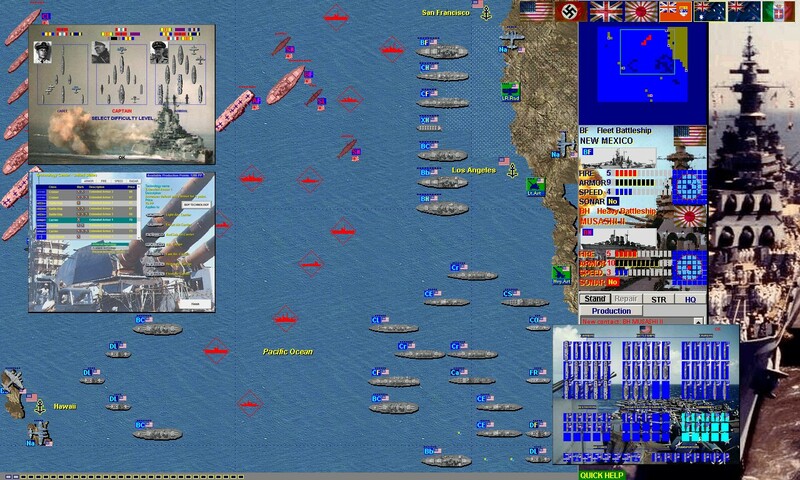 Battleship Game - WW2 Naval Strategy: the best choice among aircraft carrier games and battleship games. Although the B26 Martin (B-26) did not make its first flight until Nov. 25, 1940, its design showed such promise that 1,131 B-26s were ordered by the Air Corps in September 1940. The airplane began flying combat missions in the Southwest Pacific in the spring of 1942, but most of the B-26s subsequently assigned to operational theaters were sent to England and the Mediterranean area. Bombing from medium altitudes of 10,000 to 15,000 feet, the Marauder had the lowest loss rate of any Allied bomber--less than one-half of one percent. By the end of World War II, it had flown more than 110,000 sorties and had dropped150,000 tons of bombs, and had been used in combat by British, Free French, Australian, South African and Canadian forces in addition to U.S. units. In 1945, when B-26 production was halted, 5,266 had been built. During World War II, B26 crews began flying combat missions in the South Pacific in spring 1942, but most of the aircraft were sent to England and the Mediterranean. The 22nd Bomb Group (Red Raiders) 5th Army Air Force was originally based in northern Australia to protect the aircraft from Japanese fighter attack but often staged its flights out of Port Moresby, New Guinea. On 9 June 1942, Lt. Cmdr. Lyndon B. Johnson flew on a bombing mission departing for Lae, New Guinea. Johnson's B-26 developed engine trouble and was forced to return to base. Like the B-25, the B-26 had been designed for medium-altitude bombing, but the war brought medium bombers down to treetop level, and later versions of the B-26 were equipped with a side-mounted battery of forward-firing machine guns for strafing ground targets. The low-level bombing of Utah Beach by the Marauders during the Normandy Invasion contributed to the low casualties among the American assault force. 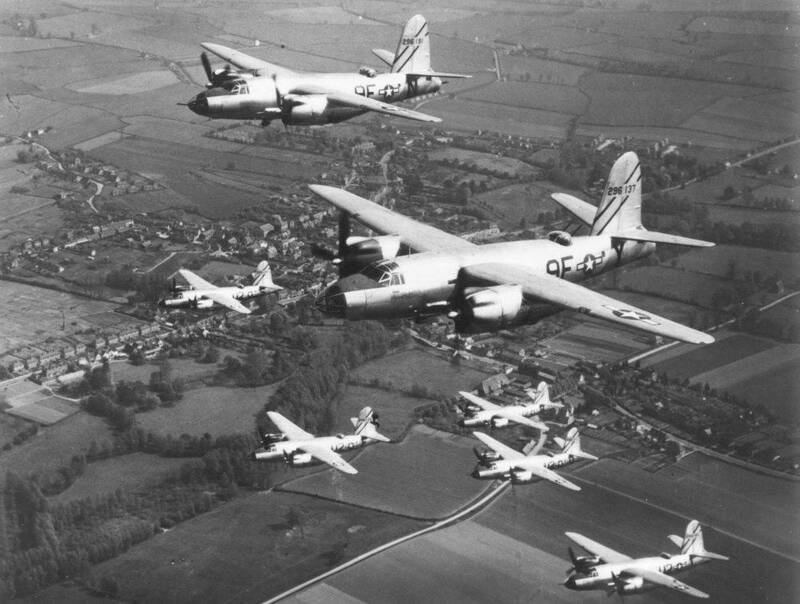 The B-26 was phased out of Army Air Force service before the end of the war. Their last mission was flown in May 1945. According to an article in the April edition of AOPA Pilot on Kermit Weeks's "Fantasy of Flight", the Marauder had a tendency to "hunt" in yaw. This instability is similar to "Dutch roll". This would make for a very uncomfortable ride, especially for the tail gunner. - AT-23A or TB-26B208 B26 Bs converted into target tugs and gunnery trainers designated JM-1 by the Navy. - B-26 B-1Improved B26 B. - C B26 BOnly 12 B26 Bs were converted into transport aircraft (all were delivered to the Marine Corps for use in the Philippines). - JM-1P-A small number of JM-1s were converted into photo-reconnaissance aircraft. While the B-26 was a fast aircraft with better performance than the contemporary B-25 Mitchell, its relatively small wing area and resulting high wing loading (the highest of any aircraft used at that time) required an unprecedented landing speed of 120 to 135 mph (190 to 217 km/h) indicated airspeed depending on load. At least two of the earliest B-26s suffered hard landings and damage to the main landing gear, engine mounts, propellers and fuselage. The type was grounded briefly in April 1941  to investigate the landing difficulties. Two causes were found: insufficient landing speed (producing a stall) and improper weight distribution. The latter was due to the lack of a dorsal turret; the Martin power turret was not ready yet. Some of the very earliest B-26s suffered collapses of the nose landing gear. It is said that they were caused by improper weight distribution but that is probably not the only reason. They occurred during low-speed taxiing, takeoffs and landings, and occasionally the strut unlocked. Later the Martin electric turret was retrofitted to some of the first B-26s. Martin also began testing a taller vertical stabilizer and revised tail gunner's position in 1941. The Pratt & Whitney R-2800 engines were reliable but the Curtiss electric pitch change mechanism in the propellers required impeccable maintenance. Human error and some failures of the mechanism occasionally placed the propeller blades in flat pitch and resulted in an overspeeding propeller, sometimes known as a "runaway prop". Due to its sound and the possibility that the propeller blades could disintegrate, this situation was particularly frightening for aircrews. More challenging was a loss of power in one engine during takeoff. These and other malfunctions, as well as human error, claimed a number of aircraft and the commanding officer of the 22nd Bombardment Group, Col. Mark Lewis. The Martin B-26 suffered only two fatal accidents during its first year of flights, November 1940  November 1941: a crash shortly after takeoff near Martin's Middle River plant (cause unknown but engine malfunction strongly suggested) and the loss of a 38th Bombardment Group B-26 when its vertical stabilizer and rudder separated from the aircraft at altitude (cause unknown, but accident report discussed the possibility that a canopy hatch broke off and struck the vertical stabilizer). The B-26 was not an aircraft for novices. Unfortunately, due to the need of training many pilots quickly for the war, a number of relatively inexperienced pilots got into the cockpit and the accident rate increased accordingly. This occurred at the same time as more experienced B26 pilots of the 22nd, 38th and 42d Bombardment Groups were proving the merits of the bomber. For a time in 1942, pilots in training believed that the B-26 could not be flown on one engine. This was disproved by a number of experienced pilots, including Jimmy Doolittle. Indeed, the regularity of crashes by pilots training at MacDill Fieldup to 15 in one 30-day periodled to the exaggerated catchphrase, "One a day in Tampa Bay." Apart from accidents occurring over land, 13 Marauders ditched in Tampa Bay in the 14 months between the first one on 5 August 1942 to the final one on 8 October 1943. B-26 crews gave the plane the nickname "Widowmaker". Other colorful nicknames included "Martin Murderer", "Flying Coffin", "B-Dash-Crash", "Flying Prostitute" (so-named because it was so fast and had "no visible means of support," referring to its small wings) and "Baltimore Whore" (a reference to the city where Martin was based). According to an article in the April 2009 edition of AOPA Pilot on Kermit Weeks' "Fantasy of Flight", the Marauder had a tendency to "hunt" in yaw. This instability is similar to "Dutch roll". This would make for a very uncomfortable ride, especially for the tail gunner. The B26 is said, by the 9th Air Force, to have had the lowest combat loss rate of any U.S. aircraft used during the war. Nevertheless, it remained a challenging aircraft to fly and continued to be unpopular with some pilots throughout its military career. In 1944 in answer to a lot of pilots complaining to the press and their relatives back home, the USAAF and Martin took the unusual step during a war, and commissioned large articles to be placed in various popular publications "educating" and defending the so called flying/accident record of the B-26 against "slanders". One of the largest of these articles was in the May 1944 issue of Popular Mechanics. Turn-based trade strategy game. Build your own world empire as an arms dealer. Trade with weapons, hire spies, agents, secretaries, bodyguards and lawyers, and establish bases and spy cells worldwide. Trading cards game combat system included. Guns Girls Lawyers Spies is a trade management game. You'll build your multinational spy company, destroy competition, hire employees, spies, and businessman, establish spy cells, bases and objects. There is a more than 40 missions with different game objectives. Martin B26 Marauder was a World War II twin-engine medium bomber built by the Glenn L. Martin Company. The first US medium bomber used in the Pacific Theater in early 1942, it was also used in the Mediterranean Theater and in Western Europe. The plane distinguished itself as "the chief bombardment weapon on the Western Front" according to an United States Army Air Forces dispatch from 1946, and later variants maintained the lowest loss record of any combat aircraft during World War II. Its late-war loss record stands in sharp contrast to its unofficial nickname "The Widowmaker"  earned due to early models' high rate of accidents during takeoff. A total of 5,288 were produced between February 1941 and March 1945; 522 of these were flown by the Royal Air Force and the South African Air Force. The B-26 Marauder was used mostly in Europe but also saw action in the Mediterranean and the Pacific. In early combat the aircraft took heavy losses but was still one of the most successful medium-range bombers used by the U.S. Army Air Forces. In September 1940, the Army Air Corps ordered 1,131 B-26s. The airplane began flying combat missions in the Southwest Pacific in the spring of 1942, but most of the B-26s subsequently assigned to operational theaters were sent to England and the Mediterranean area. Bombing from medium altitudes of 10,000-15,000 ft (3,048-4,572 m), the Marauder had the lowest loss rate of any Allied bomber - less than ?%. By the end of World War II, it had flown more than 110,000 sorties and had dropped 150,000 tons (136,078 tonnes) of bombs, and had been used in combat by British, Free French and South African forces in addition to U.S. units. In 1945, when B-26 production was halted, 5,266 had been built. The B-26 was phased out of US Army Air Forces service before the end of the war. Its last mission was flown in May 1945. According to an article in the April edition of AOPA Pilot on Kermit Weeks' "Fantasy of Flight", the Marauder had a tendency to "hunt" in yaw. This instability is similar to "Dutch roll". This would make for a very uncomfortable ride, especially for the tail gunner.